Home » Blog » Miliband was right: Cameron IS responsible! It’s astonishing just how quickly Ed Miliband’s assertion last Friday (24 April) that David Cameron has a clear line of responsibility for the migrants who have drowned in the Mediterranean over the past month or so, has become a non-issue. After being a leading news feature all day, effectively it had disappeared as a news item by mid-Saturday. 4 pages into a Google search and I can find nothing about Milliband’s speech or the furore it created more recent than ‘4 days ago’, online or in printed media. On the Friday, I anticipated the Sunday papers being full of analysis, argument and counter-argument about the speech. Nothing!..or at least nothing I could find. Undoubtedly Milliband was subject to a decidedly-vitriolic response from the Tories – environment secretary Liz Truss saying: “It’s absolutely offensive that Ed Miliband should be suggesting that David Cameron is directly responsible for those deaths, which is what he appears to be suggesting.” (BBC News, 2015b) Even Cameron’s Liberal Democrat coalition deputy Nick Clegg called Miliband’s remarks “pretty distasteful” and accused the Labour leader of “political point-scoring” on the back of a “total human tragedy”. Of all the criticism directed at Miliband, perhaps the most damaging was chancellor George Osborne’s: that he had shown “a real lack of judgment” and was “not up to the job” of being prime minister. No would-be prime minister can take afford to take that kind of blow, especially if repeated so it becomes a viral meme. Labour quickly dropped the issue and by mid-Saturday it was a non-issue. Interestingly the Tories and the media dropped it too. If everyone else was so convinced Milliband had made such a misjudgement, why didn’t the Tories and the Conservative-leaning media press home their advantage and play up the angle that it showed he wasn’t “up to the job”? After all, on the face of it, Miliband does indeed seem guilty of Clegg’s charge of political point-scoring. There can only be one reason to attack Cameron in this way at this time – which is to undermine trust in Cameron’s judgement. As a result of Cameron’s judgement re post-Gadhafi Libya, thousands of people have died, the implied narrative goes. If Cameron got it so wrong on Libya, why would you trust him on anything else? To make these points in public, in the middle of a general election, is political point-scoring. In fact, it’s such obvious point-scoring that it has rebounded on Milliband to his discredit and Labour naturally want to shove the mess ‘under the carpet’ and focus on issues like the NHS and the ‘cost of living crisis’ where they are more likely to score points without the criticisms coming back to bite them too hard. Yet, if we disassociate Miliband’s remarks from the context of the general election and apply the principles of Don Beck’s concept of Stratified Democracy, they present as highly valid criticisms…and perhaps that’s why the Tories and the Conservative-leaning media are as ready to focus on other issues as Labour are. And this is the mistake the West has made time and time again…in Afghanistan…Iraq…Gaza…Egypt…Libya… Syria…. In Syria the West has supported the rebels in principle but not so much in practice. Encouraged to fight for Democracy with inadequate weaponry, the Syrian rebels have been slaughtered in their thousands – as have civilians in rebel-held areas, creating a power vacuum from which UnIslamic State eventually emerged. The West could hardly have got the Middle and Near East more wrong if it had set out deliberately to act against its own interests and reduce the Arab and Afghan populations by a million. One root of this destructive Western mindset is the adherence to Walt Rostow’s (1960) Modernisation Theory, the objective of which is for each developing country to follow a fixed series of steps to become a democratic consumer society in the mould of the United States or the United Kingdom. This, in spite of the fact that not a single country which started out as a poor traditional society and followed Rostow’s plan has succeeded. A number which did try, though, have ended up trapped in low level civil war, unsustainable debt and far worse poverty than when they started. The second root of this destructive Western mindset is the delusion that a democratic consumer society is the ideal end state for any and every country’s development. This, in spite of HUGE and increasing disparities in the West, with some 90+% of the wealth in the hands of around 1% of the population while ever more people slide into poverty and the banking systems continue to teeter on the edge of collapse. This, in spite of soaring rates of divorce, violent crime, substance abuse, suicide and mental illness. When looked at objectively, Western society is far from ideal! Thus, continual meddling and intervention from a deluded perspective. After the complete botch-up of Iraq, one would hope that there had been more planning for Libya. However, the current chaos in Libya and the increasing presence of UnIslamic State indicate pretty sharply that whatever planning there might have been has been almost completely ineffectual. Despite the celebratory optimism of Cameron and Sarkozy in September 2011 and in spite of ‘Democracy’ being the battle cry of the various sets of protestors and rebels across the Middle East that year, there was almost no chance of Libya making a peaceful transition to a Western-style form of democratic government. Western mental myopia assumes that everyone thinks like Westerners do – the False Consensus Effect. If they don’t, then they think in an inferior way and, as Viljoen says, need to be ‘fixed’. demonstrates unequivocally that people think in different ways in different contexts – different times and different places. Much of the Middle and Far East, particularly in the rural areas, is dominated by PURPLE tribalism. This vMEME discriminates between those who belong to its tribe and those who are not-of-our-tribe. Loyalty is to the tribe and its elders, not to some government equally – and perhaps more – representative of other tribes. A BLUE religious veneer of our variety is the One True Way of believing while the other tribe’s variety is a Satanic perversion of the One True Way can form an unbelievably potent vMEME harmonic with PURPLE which can brook no deviation from the One True Way and demonise the ‘others’ as sinners who deserve to be obliterated. Thus, in part at least, the merciless atrocities which litter the very recent histories of the Middle East. The RED-driven dictatorships of Saddam Hussein (Iraq), Muammar Gadhafi (Libya) and Bashir al-Assad (Syria), etc, etc, kept the lid on these bubbling PURPLE/BLUE tensions. Their methods might have been near-feudal and brutal but, for the most part, they did not produce the large-scale slaughter of the past few years. By removing the heads of these countries (Saddam) or facilitating their removal (Gadhafi), the West also removed the control mechanisms for managing the PURPLE/BLUE tensions. Western-style Democracy comes from a BLUE/ORANGE mindset where each individual – supposedly! – takes personal responsibility to consider the issues and make an informed choice how to vote. To impose a Western BLUE/ORANGE governance concept on countries racked by PURPLE/BLUE tensions previously held in check by sheer RED power is simply too much. 4 years ago, in the early days of the ‘Arab Spring’, I wrote Well, are the Arabs ready for Democracy? to raise serious doubts about the suitability of Western-style Democracy for the general Arab mindset. The Arab intelligentsia who surfed the internet and/or travelled in the West and were exposed to the BLUE/ORANGE memes of Democracy might well have craved the introduction of a one person/one (secret) vote system in place of dodging the secret police whenever they voiced something different to official government policy. However, their fellows in the countryside and the urban poor and illiterate would ask their tribal leaders how to vote and their vote correspondingly would reflect tribal and religious interests and sectarian divisions. 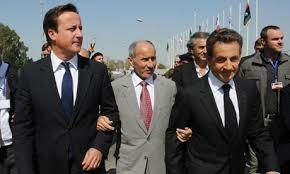 Sarkozy’s comment that Democracy was next for Libya was woefully ignorant. He and Cameron assumed in their ignorance that, once dictatorship was removed, Democracy would flower. It didn’t and their ignorance has contributed indirectly to situations which have cost thousands of lives. Effectively Western intervention in Iraq and Libya has taken those countries, not from feudal empire to functional democracy…rather it has reduced them to chaos by unleashing the horrors of PURPLE/BLUE internecine warfare. The core principle of Stratified Democracy is that the system of government (Lower Right in 4Q/8L) has to be matched to the mindset of the people to be governed (Lower Left). PURPLE tribal thinking requires government by a council of trustworthy elders who will spare the rest of the tribe the cognitive dissonance of balancing contrasting viewpoints for themselves. RED power-based thinking requires an all-powerful king or dictator who can make his/her subjects do as they are told – so everybody knows exactly where they are in the ‘power pecking order’. BLUE thinking requires a transparent, fair and just system that can have legitimate authority in the eyes of all the people the system is meant to represent. ORANGE requires a meritocracy that enables individuals to make progress as they are able to make the most of their opportunities. Thus, we can see that BLUE and ORANGE are best served by a democratic type system while PURPLE and RED are best served by a powerful royal type system which can engage the loyalties of the tribes and manage inter-tribal tensions. As long as tribal and feudal type thinking dominates in the Arab Lower Left, a parliamentary or congress-type democracy is not appropriate in the Lower Right. As Maalouf notes, it has taken the Europeans hundreds of years to evolve from feudal dictatorships to parliamentary-type democracies (and most of them are far from perfect!). So it is unreasonable to expect Middle and Far East nations to make such journeys in just a few years. The Tories and their supporters in the media know they have messed up BIG TIME in Libya. The chances are they are so caught up in their mental myopia they don’t understand why. Miliband may have been political point-scoring in a rather mealy-mouthed fashion and he may not have fully understood what he was saying…. Moreover, Labour’s decision to drop the issue indicates – perhaps not unnaturally – that winning the election is more important to them than understanding what has gone so disastrously wrong in Libya. Nonetheless, Miliband’s assertions need to be explored fully and the implications understood as to why Stratified Democracy needs to be developed if the West is not going to continue to make the same old ‘Democracy’ mistakes time and time again, costing many lives and racking up more and more problems for itself. Muslims, take back Your Religion from the Psychopaths of UnIslamic State! The Counsellor gets counselled!